Extra large flowers of bronze, scarlet, crimson, cerise, rose-pink, orange, primrose and white. Height 23-30cm (9-12"). HHA - Half-hardy annual. 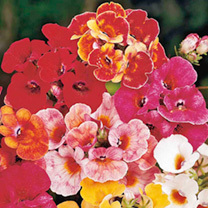 You will get vibrant colours from these popular bedding plants in sun or semi-shaded positions. Sow indoors February-May to flower June-September. Suggested planting distance 25cm (10"). Ideal for beds and borders, patio pots and containers. Prefers full sun or partial shade. Trim 'leggy' plants back - they will quickly 'bush out'.